In naturally aspirated (non turbo charged) diesel engines such as cars or trucks that can travel through varying terrain and altitudes, a means by which the fuel delivery rate can be altered is an important function of the governor and altitude pressure compensator. Since atmospheric pressure decreases with an increase in altitude, the volumetric efficiency of the engine will be less at higher elevations than it will be at sea level. On turbocharged engines, a boost compensator performs a function similar to that of the altitude compensator on nonturbocharged engines. Bosch refers to the altitude compensator as an ADA mechanism, and it is used in conjunction with either the RQ or RQV mechanical governor models. The ADA is located on the governor cover. RSV mechanical governor linkage schematic. are designed for different types of engine applications, and therefore engine speed control can be governed at different settings of the throttle. 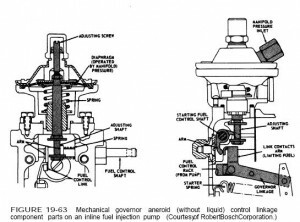 Types of governors manufactured by Robert Bosch Corporation and used on their inline injection pumps in truck applications are described below. by lack of power as well as possible rough idling and stalling. Either a vacuum gauge or a mercury manometer can be use to check the restriction to fuel flow. However if a mercury manometer is teed in to the fuel system in place of the special gauge make sure that you hold or mount the manometer higher than the engine. Failure to do this can result in diesel fuel running back in to the manometer when the engine is stop. A low reading is what we are looking here , since this indicates that the fuel lines and connections are offering a minimum restriction to flow at the suction side of the fuel transfer pump. This test is a check to ensure that the injection pump relief valve is, in fact, opening at the correct pressure and that the transfer pump is performing correctly. If the relief valve is stuck open or is opening at too low pressure, the fuel delivery pressure within the injection pump housing will be too low to sustain sufficient flow to the plunger and barrel of the individual pumping assemblies. On the other hand, if the relief valve is stuck closed or opens at too high a pressure setting, the fuel within the injection pump housing, which is also used for cooling and lubricating purposes, will run hot. This can result in a loss of horse power due the expansion of the fuel, since a less dense fuel charge will be delivered to the injectors and combustion chamber. In addition fuel that is too hot can cause internal pump pluger damage due to its instability to properly cool and lubricate the component parts. Note that only 25 to 30% of the fuel delivered to the injection pump housing is actually used for combustion purposes. The remainder cools and lubricates the injection pump components.